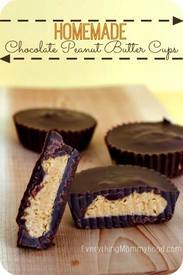 Homemade Chocolate Peanut Butter Cups are always a comfort food and at the top of my list if I’m wanting something chocolate-y. You can always buy store bought ones, but homemade ones are just SO much better. Once I figured out how to make these myself and I tweaked the recipe a bit to get it just right, I never buy the store bought Reese’s Peanut Butter Cups. These are just so much better and really are not difficult to make at all.